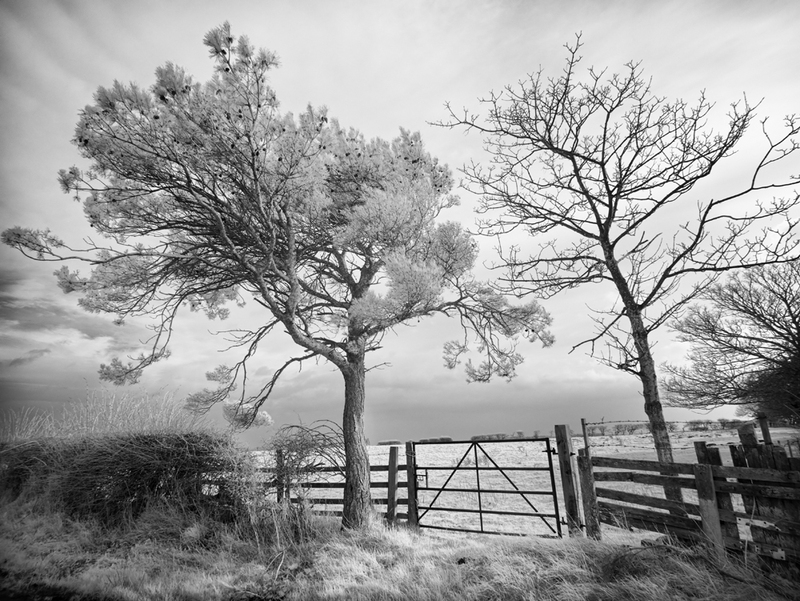 A little while back I reported that I was struggling to get my Infrared images from my GX1 to meet my expectations. I was experiencing difficulties with depth of field, focus and my images seemed grainy and soft. And whilst I did achieve some improvements to the quality I wasn’t entirely satisfied the results. The real problem however is that I have nothing to compare my results against so it might be that all Infrared images are soft and grainy. Well, I have had something of a revelation over the weekend and have achieved some very high quality images with which I am delighted. The source of my problem was identified after a friend sent his Nikon camera for conversion. When returned the lens had the UV filter removed and this had been carefully packaged with a note saying “DON’T USE WITH INFRARED”. When he spoke to the company they said they had encountered a number of problems in the past when these filters are used on converted cameras. Whilst all filters are not the same, there is no way of telling which cause a problem so he was recommended to buy a clear glass lens protector instead. As soon as I heard this I searched the internet but couldn’t find anything about this problem. I decided to do some quick tests by simply removing my UV filters (expensive B&W ones) and the results were amazing. The areas that had been very soft were now much sharper. The graininess that had been apparent in images had now cleared. The images were now significantly sharper with fine details appearing crisp. And the distortion appearing towards the edge of the frame (especially in the corners) was reduced significantly, down to levels expected with these lenses. Now you might recall that I mentioned my 45-200 lens didn’t display such strong problems as my 9-18 lens and that my 18-45 lens was worse than the others. Well checking the filters, the one attached to the 45-200 was a cheap 7 Day Shop UV filter which appears to have much less effect than the B&W filters. When I checked the B&W filters I found one of them caused more problems than the other. I am now on the lookout for clear glass 52mm filters that do no filtering at all. Until I find them I will be shooting with the front lens element exposed. Very interesting discovery & it all makes sense when you think about it. I really like the image attached with this blog. Excellent result. Thanks, I’m very pleased you like it. Amazing shot and your blog is great. I’m actually thinking about getting a GX1 modified to use as an IR camera (managed to snag one new for £200 after cash back) and came across your blog thanks to the wonders of Google. 1) Did you get decent (or just useable) AF when you removed the UV filters? 2) What kind of IR filter did you have fitted to your camera (I’m guessing 720nm)? 3) How long did it take for ACS to do the conversion? 4) Do you use the EVF on your IR modified GX1? 5) How is the 9-18 without a UV filter – any issues (I own that lens, so it’s a prime candidate for use with a modified camera)? Great that you like the shot – thanks. What a bargain you got with the GX1. I thought I did well getting a recon unit for £250. 1. I now get good AF either with or without the UV filter. The problem with the UV filter is not that it stops focus but it seems to distort the image. 2. Yes the filter is the 720nm. 3. ACS took 2 months to do the conversion but most of that was waiting for the filters to come in from the US. I didn’t mind as I wasn’t in a hurry. I would suggest calling them in advance if you want anythng faster. A friend just had his Nikon converted through ProTec in under a week but they only do Nikon and Canon I believe. 4. No I haven’t used the EFV although it will work just fine as it takes the signal from the sensor. I like the touch focus on the rear LCD of the camera so I tend to only use the EVF on very bright days now. 5. The 9-18 is a super lens with the IR camera and I use it a lot of the time. We haven’t exactly had the bright sunny days to check it out but I think there is a very faint colour shift in the centre of the lens. It hasn’t caused me any noticeable ptoblems however. 6. Yes Video wokrs but I think you will need bright light. The colours are also horrible. Email via my Lanscraft website and I will share a couple of additional things. Thanks for the (very detailed) reply, much appreciated. I’ll drop you a note to the contact email on your website.